One of the best selling sit on top's on the market, the Scooter is a great all round sit on top that anyone can enjoy. The Wavesport Scooter has been hugely popular over recent years and has established itself as one of the best Sit On Tops on the market today. 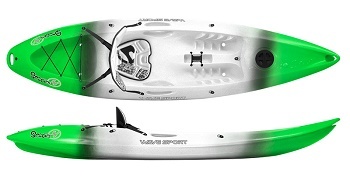 The Wavepsort Scooter's hull combines tracking channels and a defined skeg to offer both directional stability for exploring and manoeuvrability when playing and surfing. The Scooter will suit paddlers of all abilities due to its smooth and predictable ride and its stable and predictable nature make it popular with both children and adults. Wavesport have designed the seating area to be comfortable if you are paddling solo or with your child, allowing them to get plenty of practice before going afloat on their own. The Scooter has a stylish sleek deck with moulded in handles for ease of carrying and car topping, a front storage hatch for any essentials (always use a dry bag even in a hatch) and a large rear storage area with bungee's for a dry bag. The Scooter comfort also includes the seat as pictured. A set of thigh straps (optional extra) will help to give extra control in the surf and rougher conditions. 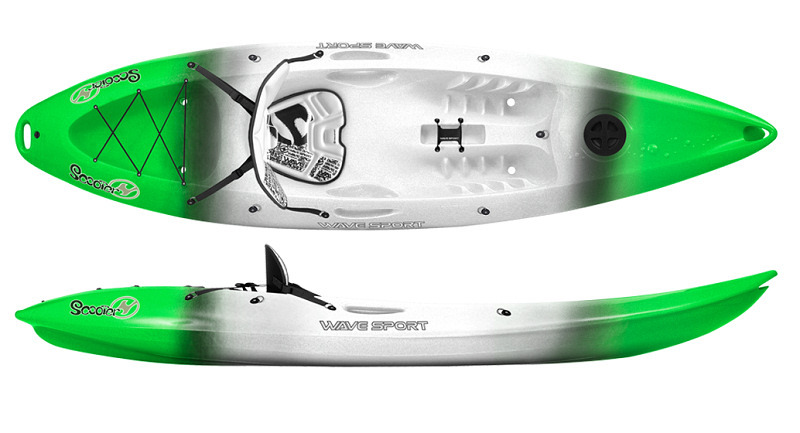 Made in the UK by Wavepsort Kayaks using Perception/Wavepsort specialist technology and materials. 1 durable round rubber hatch. Bow, Stern and Side handles. Rental spec available to order only. Thigh Straps connect to the kayak and hook over your legs to give more control over the kayak. When you capsize they just slide off to allow you to fall away. 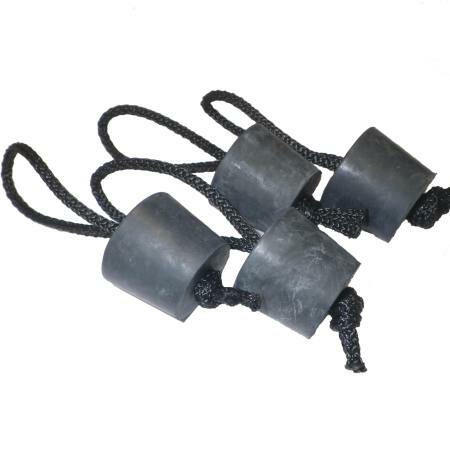 Scupper plugs are used to fill the drainage holes of the boat and are for use in calm conditions to stop water shooting up through. Heavy duty drybag for keeping your stuff dry! The 15 litre is a perfect size for some food, dry clothes and fits in to the rear storage area nicely. Folding trolley for transporting your sit on top Kayak, uses the scupper holes of the kayak to transport the kayak. Please note that these colours are a representation, actual may vary slightly. We offer a delivery service for the Wavesport Scooter throughout the UK & Ireland to home and work addresses. If you are local to our shop in Hamworthy, Poole then we may be able to deliver a Wavesport Scooter with one of our own vehicles. For boats, this is free to most BH Postcodes - please call us on 01202 625256 to discuss your requirements. Buy a Wavesport Scooter online from our website and collect from our shop in Hamworthy, Poole or you can collect from any branch within the Canoe Shops Group. There is no cost associated with instore collection.